John Wilde; developers of Funeral Manager, and Cloudberry Funeral Management Solutions; developers of InMemory, are delighted to announce the release of their product integration development. The data exchange ensures a seamless, automatic flow of data between the two systems. Funeral Manager is the most widely used funeral arrangement software in use by Funeral Directors in the UK today. The integration allows Funeral Manager users to utilise the InMemory FD Info database which holds a comprehensive database on the various funeral locations (burial grounds, churches, crematoria and cemeteries), including customisable local fee structures and all relevant people involved from these locations e.g. ministers, celebrants, organists, vergers, location booking staff, church wardens etc. 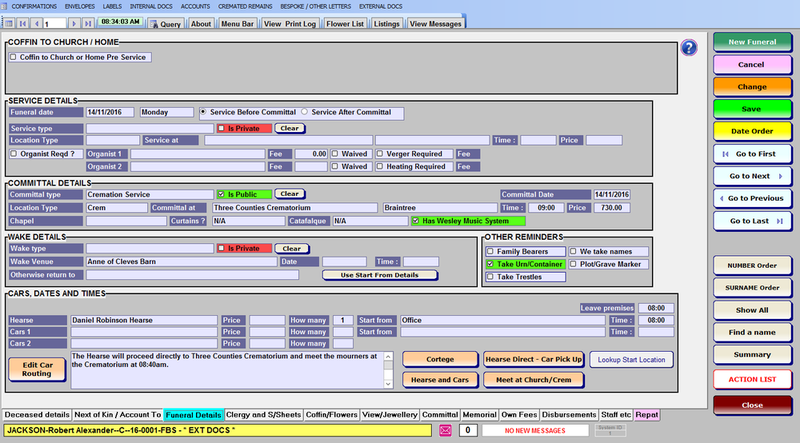 This data is then automatically updated and can be used when arranging the funeral using Funeral Manager. When Funeral Manager saves the funeral arrangement, it then automatically sends the arrangement data to InMemory and adds the arrangement data into the InMemory system. Users then simply choose the charities, add the photographs and biography and the collection page is then live and available to collect online and offline donations. InMemory manages the donations process and Funeral Manager manages the rest of the funeral arrangement.